We had the pleasure of being invited by Thornager’s to photograph the Trustee’s dinner at Lowell Observatory. 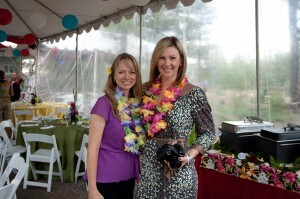 Thornager’s always does a fabulous job with their events and this luau did not disappoint. Karen from Thornager’s enlisted Glamorous Occasions and KD Event Designs for a little extra style and design help. Dana from Glamorous Occasions put together beautiful tropical flower centerpieces with plumeria flown in from Hawaii that morning. 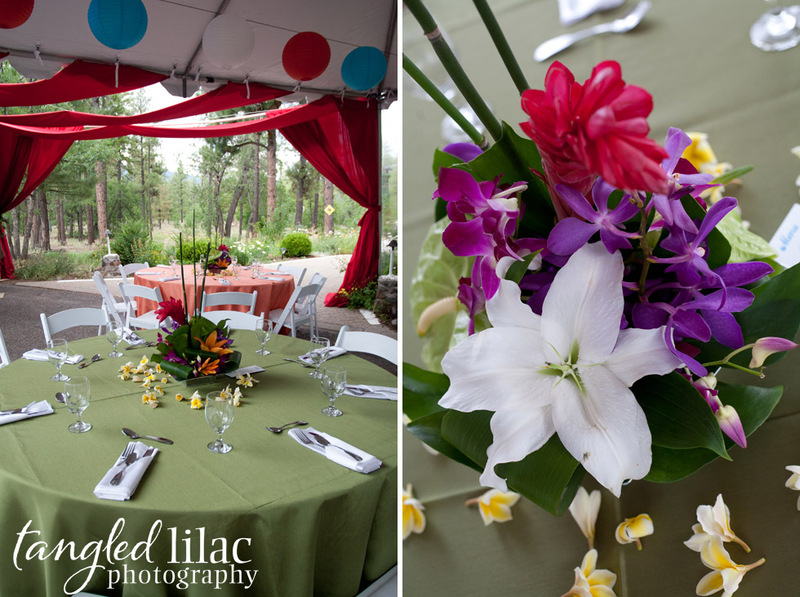 Kim from KD Event Designs brought the theme together with the bright colored table clothes and custom paper goods. The guests were greeted with colorful lei’s and a signature Hawaiian cocktail. Thornager’s prepared a delicious island inspired meal with entrees including fresh mahi mahi with a macadamia nut crust, huli huli chicken, and soy marinated grilled tofu. They topped the dinner off with tropical sorbet and Hawaiian lilikoi cookies, yum! We even got in the Hawaiian spirit for the party! Thank you to Tim from Thornager’s for the fun photo! If you haven’t been to Sedona Arizona, try and plan a trip. Not only does this visual paradise of red rocks have miles and miles of panoramic views and endless hiking trails, but it’s also a hub of premier road and mountain biking. I live in Flagstaff, just 25 miles away, and my husband and I love to visit Sedona on a regular basis to take advantage of their warmer weather and outdoor adventures. I’m always taken aback when I drive into town; the views are spectacular! When asked if I could do a cycling photo session for my friends at Absolute Bikes, I jumped at the chance. They are in the process of redoing their website and needed some fresh images to showcase this beautiful area. Grant and I had a great day hanging out with everyone! Check out their shops in Flagstaff and Sedona for great equipment service, sales, rentals and cycling information. We were so excited to have the opportunity to do something different and photograph Diablo Burgers fabulous food! For those of you that have not dined at this establishment, you are truly missing out. Diablo Burger is a 100% local food based burger joint located in downtown Flagstaff. All of their burgers are made from local, open-range raised, antibiotic free and hormone free beef from the diablo trust ranches. In addition to their delicious and unique burgers they have an amazing grilled cheese, gourmet french fries, and fantastic soups and salads. To add to the local theme, Page Springs Vineyards & Cellars has created a special red blend to be served exclusively at Diablo Burger. Just looking at these photographs makes me hungry!